On Tuesday, Adam Sandler, Saturday Night Live's Opera Man, writer and performer of The Hanukkah Song, and actor in 41 films and TV programs, joined the 2,430 movie industry notables who have received stars on Hollywood's Walk of Fame. 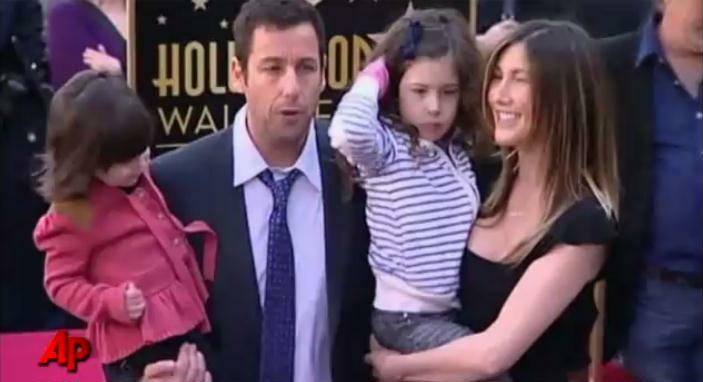 Sandler brought his two daughters, ages 2 and 4, to Tuesday's ceremony in front of the W Hollywood Hotel. The girls stole the show, taking the microphone from their father several times during his acceptance speech to say "I love my daddy." "Let's hear it for my kids, who are now showing you that I cannot control them," Sandler joked. Actor Henry Winkler spoke on Sandler's behalf, telling the crowd that the location of Sandler's star is bashert, Yiddish for meant to be, since it is located directly across the street from his own. Sandler, who gained fame on "Saturday Night Live," has starred in such films as "Big Daddy," "The Wedding Singer" and "50 First Dates." His new film, "Just Go With it," in which he stars with Jennifer Aniston, opens later this month. Here is a short summary video of the event, followed by the full 15 minute version including comments by actors Henry Winkler and Kevin James, and Sandler's acceptance speech. Enjoy! Israeli Comedy Sketch - "First Time In New York"